Drones might be aggroed. Pocket aggro can be managed by attacking the correct NPC groups. Acceleration Gate is 58km from warp-in. Fitting an afterburner is recommended. Proximity aggro on groups 2 & 3 when within 6km of the gate. Attacking Group 1 OR 3: Aggroes whole pocket. Attacking Group 2 OR 4: Aggroes Group 1 & 3 only. The last group will remain neutral and can be aggroed separately. Note: Attacking Group 4 may only aggro Group 1. I'm not sure it always works. Note: You can Eiminate both groups 4 and 1 without drawing pocket agro but it gets a bit complicated. you need to fly your ship off to the side putting the station ruins between your ship and groups 1 2 and 3. after your within range eliminate group 4 this will draw group 1 agro. if you wait for a few minuts after destroying group 4 you will notice that group 1 will be stuck in the station ruins unable to get close to you. additionally they will have drifted out of agro range of the other 2 pockets. at this point it should be safe to eliminate group 1 without 2 and 3 agroing you. Group 1 can be ignored. No auto-aggro and is not required for mission completion. Kill Group 3 (including the Blood Raider Personnel Transport ) of pocket 2 and loot the Militants. Attacking Group 1 in Pocket 2 first will not aggro the other groups. Any t2 Em/Therm tanked bs can do this mission without any problem, the dps of this mission is ridiculous since all npcs come from very far. First shoot all cruiser with "sage" and "priest" (they use nosferatus) as primary , make your drone kill all frigates and snipe the rest. Finish with bs's. I have had this mission with 2 and 3 Blood Raider Personnel Transports. When there were 2 of them, it was NOT enough to kill these to complete the mission. Instead mission was completed after I killed ALL of the aggressing ships. Only the last non-aggressing group of frigs was left. The LAST killed ship drop the container with the militants. Don't let them come in too close because the dps then shoots up in the air for them and your shields will drop quite fast (it happened to me but that was because i was falling asleep hehe...), woke up and found them all close and dangerous :). Killed all BR Personnel Transports, mission did not flag as complete until all other ships were destroyed. Last one killed (a frig) dropped the Militants in a can. Mission was flagged complete after killing 2 BR Transports. 2nd transport dropped can. In 2nd room, when group 2 was engaged, entire room except 2 frigs and 2 cruisers from group 4 aggroed. Group 1 functioned as stated. This mission varies in aggression pattern and can drop. Use this as a guide, but it is not always 100% correct. Bear in mind that your experience in this particular mission may vary. This mission was changed somewhat, of late. 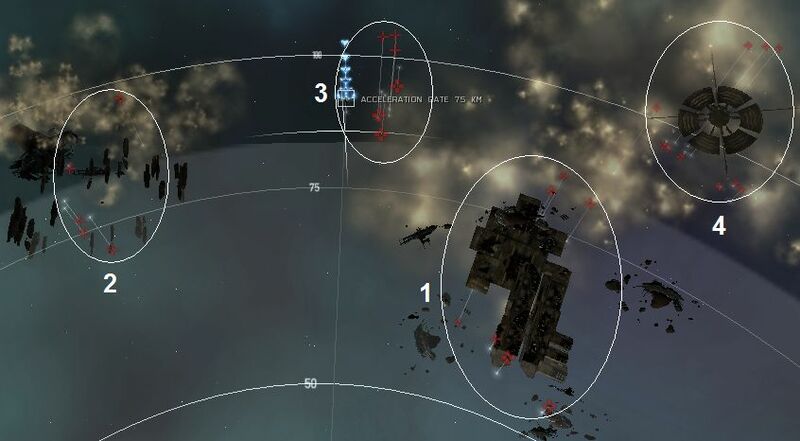 In Pocket 2, Group 1 consisted of 5 frigates. You can attack it without any aggro from the others. Group 2, however, now consisted of 2 Battle Cruisers and 4 BS's. The same for group 3, and attacking group 2 aggro'ed group 3. Group 4 consisted of 2 frigates and 2 cruisers. The mission did NOT flag upon destruction of the Transports, but of the entire 3rd group, which they were part of. From my experience, killing Group 3 will complete the mission in the second pocket. Consists of 8 ships which are right next to Groups 2 and 4. Suggestion for Blitz is to target all of them before engaging (if you can't target them all than leave out the Industrials and target them when you can) and than just use Militants from elsewhere. In pocket 1 today, I aggro'd group 4 first and only got aggro from group 1. Took em out at leisure and then aggro'd 2 and 3. Killing the 2x transporters does not flag mission complete any more. Pocket 2, I aggro'd 4 first which aggro'd 3. Destroyed the BS's in group 3 and lastly the transports. The last transport dropped the can with the militants and mission was marked complete. Didn't need to kill the last two groups. Did that Missi in a Domi with 2 x Therm T1 Hardener und 1 x T1 EM Hardener and Ogre Drones. Handled all enemies with mostly 1 medium repairer.... Very easy! Attacking Group 4 only aggros group 1 *not* both 1 and 3. Confirming: Killing the 2 Transports only does NOT flag the mission as finished. Please correct the info in the original explanation! As said before. This mission may vary. So use the above as guidelines. Pocket 1: U warp in at a distance. Keep it. Watch your agro. (Makes it very easy). Same for pocket 2. Gank/Snipe--no tank actually required if stay at range. 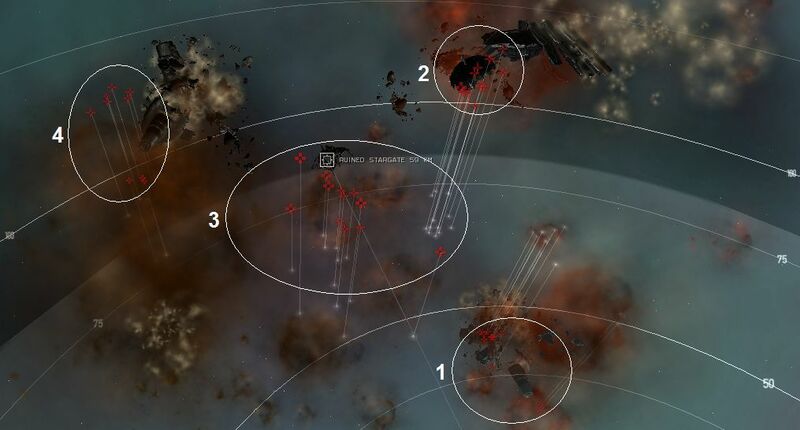 [Pulse Apoc: Scorch, TC + range script, AB, Heatsinks x 3+] No-damage range would mean around 65km from the Apoc-hull NPC battleships; lasers instead of pulse + scorch should be fine. Would suggest a good AB and very light tank for Ravens/CNRs as well: Unprotected shields got minimal damage (stayed 90%+), and that only when I got sloppy. Kill smaller ships first, of course. More fun with a buddy. Ravan and a Drake just rocked this mission. This tutorial needs to be completely redone. The second room groups did not match this tutorial at all. The mission did not show as complete for me until every ship in pocket 2 had died. As the last War General went down, I had already looted both transports so I can confirm that you must now kill all to complete. Luckily, this is a very easy mission. I completed it in a Drake with low skilled alt who has all shield skills at 4 and all missile and BC skills at 3. Never in any danger, took 45 mins in all. Easy money. The mission completed for me when I had two battleships and the frigate group left. I suspect that group 3 is all that must be destroyed. Militants not only drop from the transports, but the last ship killed also drops one. Pocket 2: attacking group 4 aggroed group 3 only. Killing both groups flagged mission as completed. Completed in Caldari Navy Raven I had to turn my shield booster on only once in each pocket for a few seconds. Very easy mission. To blitz you must kill all the ships in group 3 not just the transport ships! Aggro group 1, while putting them out of their misery..click on a personnel Transport and "approach". when 35km or so you get aggro of the third/center group.Help them out of their miserable lives and leave Transports for last. Misn flagged complete when 2 transpo go boom. 2 other groups are having a staring contest, while I turn in to agent. Easy in a T1 Abaddon. Suggest an AB to get to the Pocket 1 gate quickly, or start your move early. The first pocket has been redesigned, but the groups are still the same with the same aggro rules. So don't freak out when it looks different. The second pocket did not aggro for me in the reported way. After killing group 1, I aggroed group 4 which aggroed the whole pocket. If this is what you mean in the report, please say it more clearly. You only say that 2 and 3 are linked, which implies that 4 is also safe to aggro on its own. Luckily, by simply moving on the transversal in my AB Abbadon, they didn't even get down to my armor until the last two battleships. Easy done in a half T2 fit Harbinger. Never in real danger. Just kite them - my optimal is 38km and kill the small stuff first. Don't close in on BS. Killed everything in 50 min. Extremely easily completed in t2 passive raven (1xInvuln, 2x specific, 3xLSE). The BS can't track or hit you about 24 mins. Completed in a 3.5m SP pilot in a Raven. Kite the Battleships and the DPS is minimal. CONFIRM the aggro in first pocket, I aggroed group 2 and 1,3 came with but 4 stayed put. Pocket 2 had group one and the rest were sort of blobbed together. Aggroed group one alone, killed it, aggroed the closest ship out of the blob and the rest came at once. Cruise Missles: 400ps - 130km range.